If you are looking forward to the transition from indoor comfort food to an active spring lifestyle that includes eating fresh local vegetables, then you may enjoy Creamy Coconut Rockfish Soup. This recipe brings together the best of our winter diet and spring’s earliest bounty. It can be natural to crave nourishing stocks and soup in the early spring while the weather is still chilly and the local fresh vegetables suitable for eating raw are still basically hard to come by. During this time, herbs combined with savory flavors of marrow and saturated fats delivered by way of broths provide an ideal medium for fresh spring vitamins while reducing the amount of dense meat consumed and preparing us for the season to come. To make the broth: In a large sauce pan, heat olive oil over med – high heat. When oil is glistening add the Shallots and soften but don’t brown. Add Carrots, Celery, Mushrooms (both), and saute for an additional 8 minutes until softened. When the vegetables are soft, add the garlic and ginger and saute about 30-seconds or until just fragrant. Lower the heat to med – low and add the fish sauce, soy sauce, rice wine vinegar, chicken stock, coconut milk, and kaffir lime leaves. Gently simmer for 30 minutes and until the flavors develop. After 15 minutes taste and adjust seasoning as necessary. If salt and pepper is required, please add to your taste. No need to add more soy sauce. 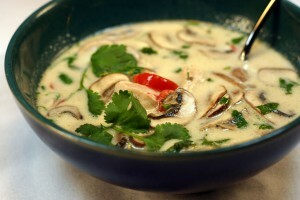 Continue to cook until heated through and stir every 10 minutes or so to bring the broth and coconut milk together. If it appears to curdle, no worries, stirring will eliminate that. It’s more that the fat is separating but will not affect the final outcome. Add Fresh Cilantro leaves and chopped scallions reserving some of both for garnish before serving. While the soup is simmering, sear the rockfish portioned fillet for 5 minutes on each side. Then add the rockfish to the soup, simmer for 12 minutes and serve immediately. Otolith's Delivery Service has scheduled distribution routes throughout PA, NJ, DE and NYC. For delivery to your door or to send a gift of wild fish, Email sales@otolithonline.com or call 215-426-4266. Your order request will be returned within 72 hours. Orders over 20 lbs. can be shipped overnight outside of PA, NJ, DE and NYC; additional shipping charges apply. Overnight deliveries outside of PA, NJ, DE and NYC will be shipped either UPS or Fed Ex. otolith sustainable seafood is proudly powered by WordPress and BuddyPress. Just another WordPress Theme developed by Themekraft.